Abstract : One challenge in portraying large-scale natural scenes in virtual environments is specifying the attributes of plants, such as species, size and placement, in a way that respects the features of natural ecosystems, while remaining computationally tractable and allowing user design. To address this, we combine ecosystem simulation with a distribution analysis of the resulting plant attributes to create biome-specific databases, indexed by terrain conditions, such as temperature, rainfall, sunlight and slope. For a specific terrain, interpolated entries are drawn from this database and used to interactively synthesize a full ecosystem, while retaining the fidelity of the original simulations. A painting interface supplies users with semantic brushes for locally adjusting ecosystem age, plant density and variability, as well as optionally picking from a palette of precomputed distributions. Since these brushes are keyed to the underlying terrain properties a balance between user control and real-world consistency is maintained. 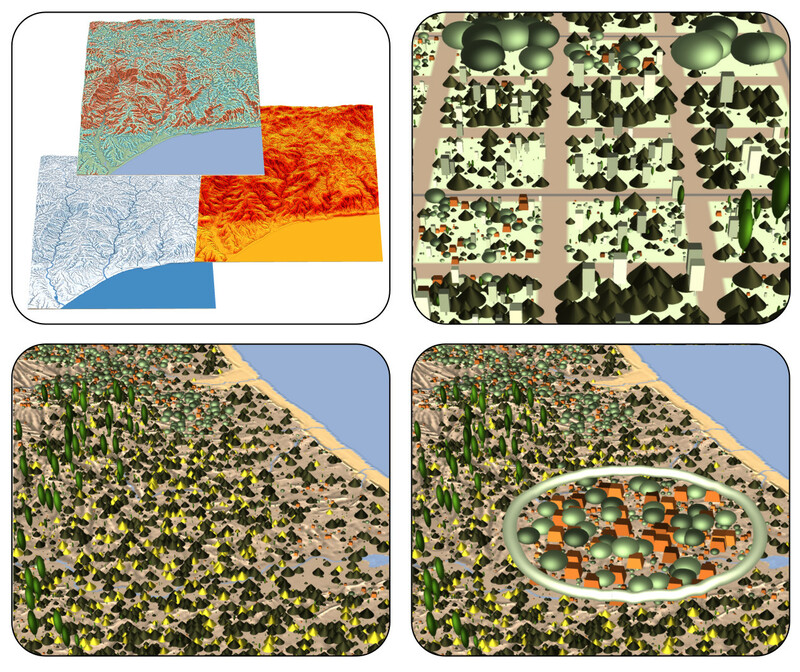 Our system can be be used to interactively design ecosystems up to 5 × 5 km 2 in extent, or to automatically generate even larger ecosystems in a fraction of the time of a full simulation, while demonstrating known properties from plant ecology such as succession, self-thinning, and underbrush, across a variety of biomes.